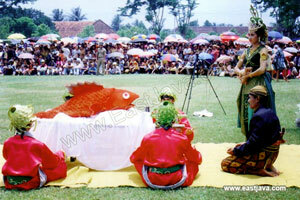 Ceprotan Ceremony is located in Sekar village, Donorojo District. This ceremony is the tradition activity of Sekar village custom, otherwise it always executed in Dulkangidah month (Javanese Month) friday or monday. This activity meant to memorize a legend of the goddess Sekartaji and Panji Asmorobangun through of "Bersih Desa" activity. Sekar village people hold the purification by throwing young coconuts. First the drama dance of Ki Godek and Dewi Sekartaji, continued by Ceprotan (throwing young coconuts) held by teenagers which consist of two group that throwing each other. At that time there fantastic sight if coconuts water spurting up to the air. It about 30 minutes from Pacitan city. This area also equipped by hotel for the tourists comfort in visit this tourism object. Hotel is a real vital supporting facilities in Pacitan Regency.